Iraqi clergymen attend a Christmas mass at the Saint Paul's church on Dec. 24, 2017, in Mosul. Hymns filled a church as worshippers celebrated Christmas for the first time in four years after the end of ISIS' rule. Tens of thousands of Christians fled northern Iraqi towns in 2014 as the Islamic State group seized Mosul and swathes of the surrounding Nineveh province. 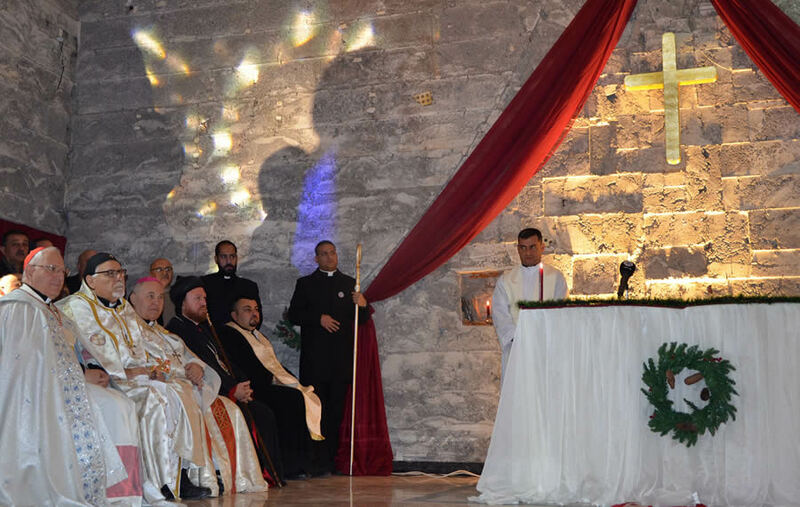 Iraqi Christians celebrated their first Christmas in Mosul since Iraqi security forces declared ISIS defeated and ended the terrorists’ brutal three year occupation. Christians in Iraq decorated war-torn Mosul with Christmas lights and Christmas trees and even had a visit from Santa for the first time since their last Christmas celebration in 2013, according to The Jerusalem Post. The return of Christmas celebrations to Iraq comes in the wake of Iraqi security forces’ declaration Dec. 9, of ISIS’s defeat and of its control of the Iraqi-Syrian border. Christians and Muslims alike took part in the festivities, and a 17-year-old girl even dressed up as Santa Claus and handed presents out to children of both faiths in the streets of Old Mosul. “It might seem strange to hear that a female Santa Claus has appeared in this city, but I wanted to give the people here a simple gift — to bring Christmas to a place where it had been banished,” Ghenwa Ghassan said according to JPost. The return of Christmas to Mosul does not mean all is well, however, as members of the community are still reeling from the effects of the war. Students cleaned out damaged churches and rubble-strewn streets to prepare for the celebrations, but clinical psychologist Evon Edward told JPost the celebrations are more a sign of habit than of true recovery. “The community is still severely affected by the war, people are celebrating out of habit with dulled senses and cold emotions,” said Edward, who lives in an Assyrian Christian enclave in the Nineveh Plain. Iraqi Christians returning from asylum in foreign countries also face the challenge of harsh criticism from fellow Christians who stayed and suffered under ISIS and who, some say, have been influenced by ISIS’ ideology concerning harsh rejection of those perceived to be unbelievers. Still, with only an estimated 300,000 of the original 1.5 million Iraqi Christians remaining in the country, the return of Christmas and of Christians who fled, has brought at least some small amount of healing to a region long parched for it. “It was heartwarming and tear-shedding to enter my morning class and see the lighted Christmas tree after three dim years of ISIS rule,” Ali Al-Baroodi of the Translation Department at Mosul University’s Faculty of Arts told JPost.